Shade Garden Perennials for a Spectacular Landscape! Today, I am going to talk about shade garden perennials. 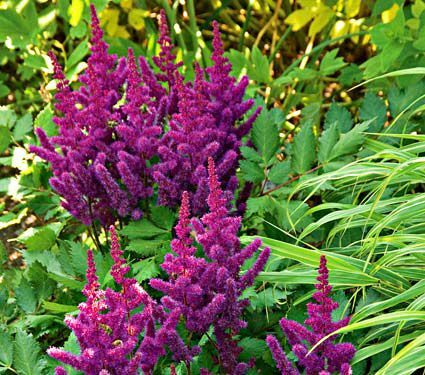 These shade garden perennials will not only thrive in a shady garden area but will make your home look spectacular. 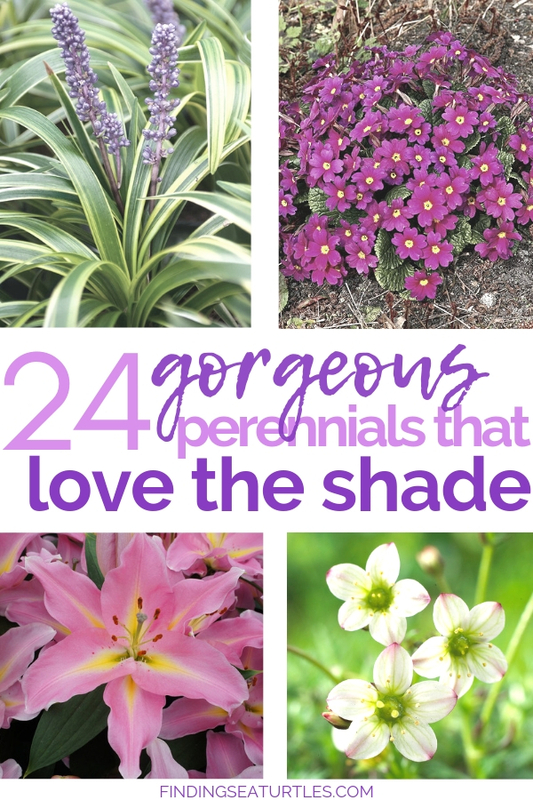 There are many types of shade loving perennials available to landscape your garden so that it looks spectacular. Some of the shade loving perennials are prized for their spectacular blooms. Some perennials are prized for the stunning foliage. It you have an area in your yard that receives limited sunlight, there is no need to sacrifice style or design. 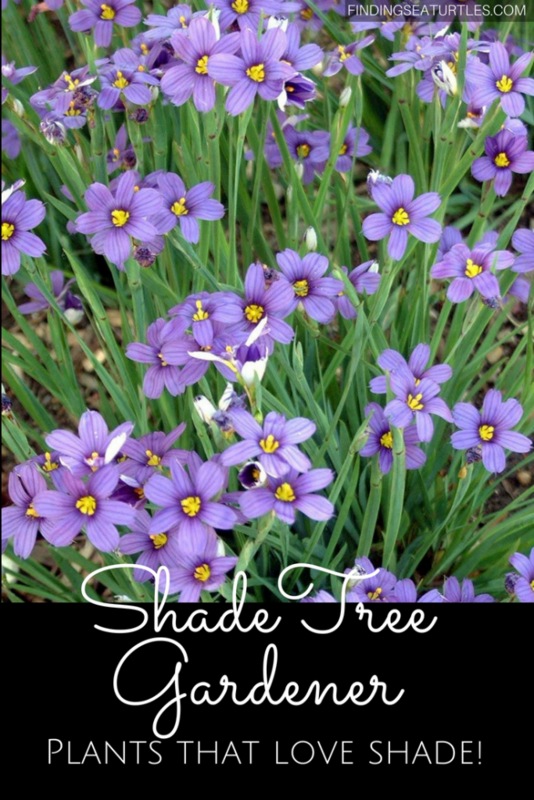 Your shade garden can be just as spectacular as your sun drenched garden. We’ve listed some shade loving perennials that can provide great garden style to your home. Some of these shade thriving perennial selections are deer resistant. Since we have a year around problem with local deer, we are always on the lookout for deer resistant plants. Take a look and let us know what you think. 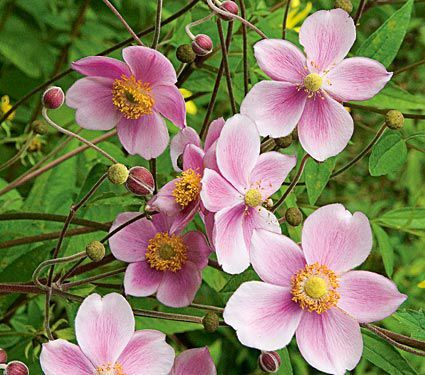 The Anemone x Hybrida ‘Robustissima’ is a Japanese anemone that blooms between August and September. The Robustissima with its beautiful soft pink blooms can reach up to 4 feet tall. And one of several deer resistant shade garden perennials. You can’t go wrong with this beauty! Perfect for zones 4 to 8S/10W. 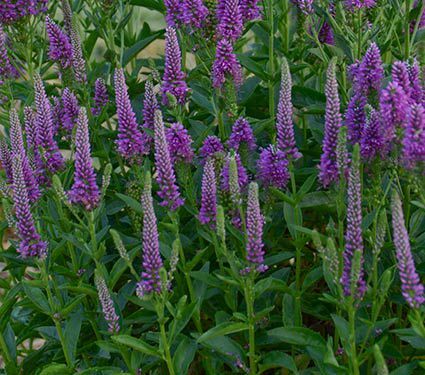 The Veronica ‘Very Van Gogh’, a deer resistant perennial, blooms between July and August with vivid purple spikes. The Veronica, known as Speedwell, can grow between 18 to 20 inches tall. 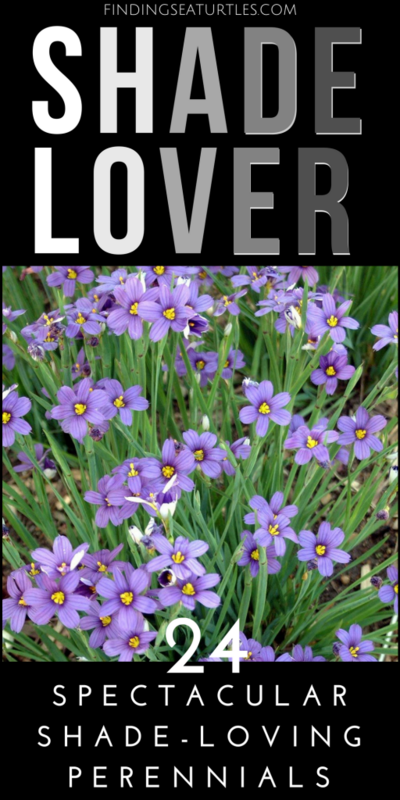 Thrives in a sunny to partial shade garden. Likes zones 4 to 8S/W. The Helleborus Winter Magic ‘Snow Love’, commonly known as a Lenten Rose, thrives in a partial shade to shade garden area. The fresh green blooms appear in March and April. Winter Magic Snow Love reachs a height of 12 to 15 inches tall. 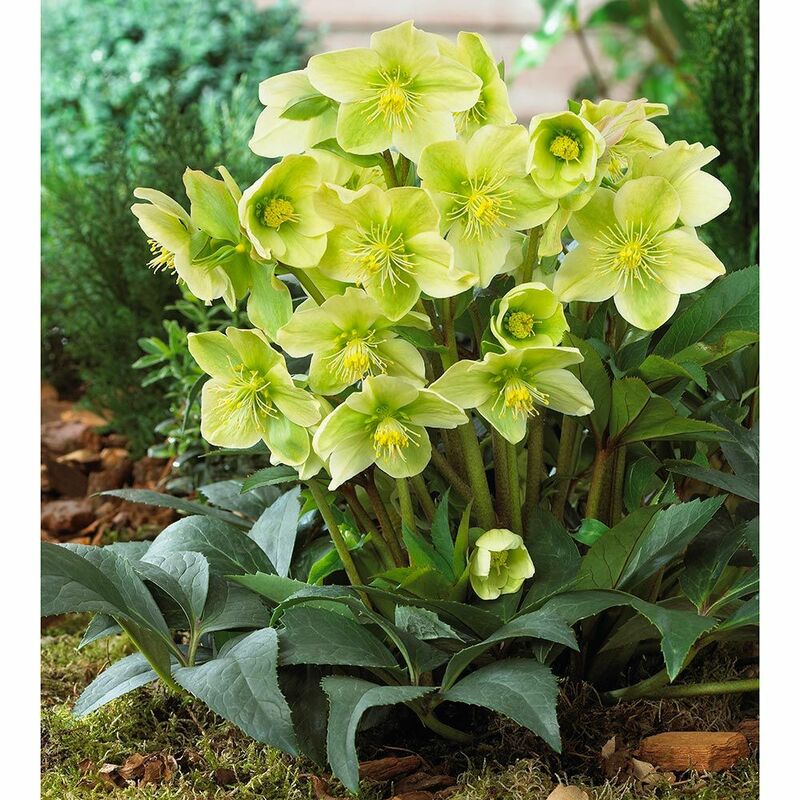 The Snow Love Helleborus is deer resistant. A stunning addition to a shade garden perennials area. Snow Love can be grown in zones 5 to 8S/10W. The Astilbe Chinensis ‘Vision in Red’ blooms in July. Vision in Red tops out between 15 to 18 inches tall. Astilbes tend to be tough and pest free. Vision in Red provides great spectacular color to any shady garden. Grow Vision in Red in zones 4 to 8S/10W. The Hemerocallis Daylily ‘Apricot Sparkles’ Reblooming has 3 inch apricot flowers. Apricot Sparkles blooms from June to September. 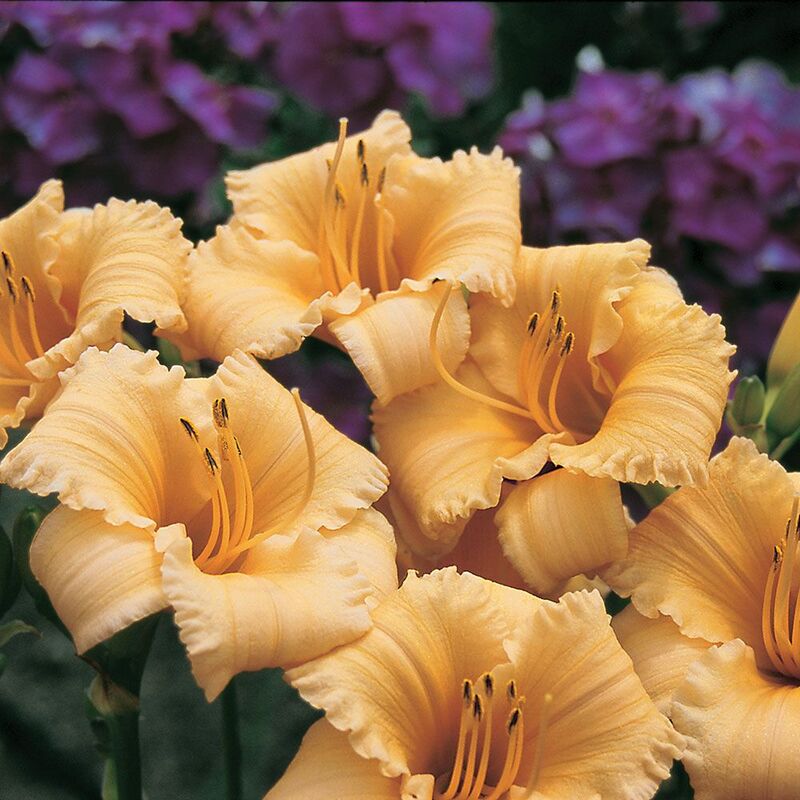 The Daylily reaches about 18 inches tall. Apricot Sparkles thrives in a sunny or part shade garden. Hemerocallis Apricot Sparkles grows in zones 4 to 9S/W. The Dicentra Spectabilis or Bleeding Heart perennial thrives in a part shade garden area. Blooms appear in May and June. 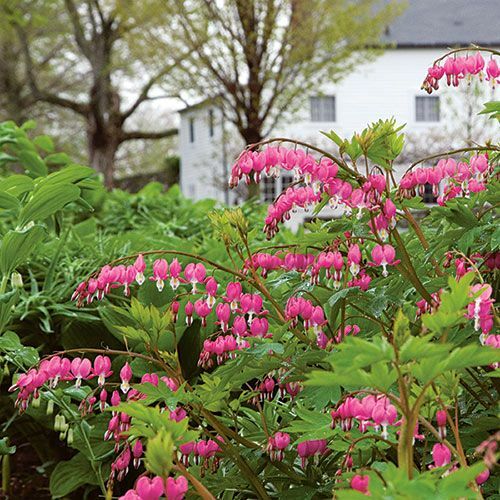 The Bleeding Heart with heart-shaped pink flowers reaches 30 to 36 inches tall. Dicentra Spectabilis is deer resistant and favorite of the shade garden perennials. Plant Dicentra in zones 3 to 8S/9W. 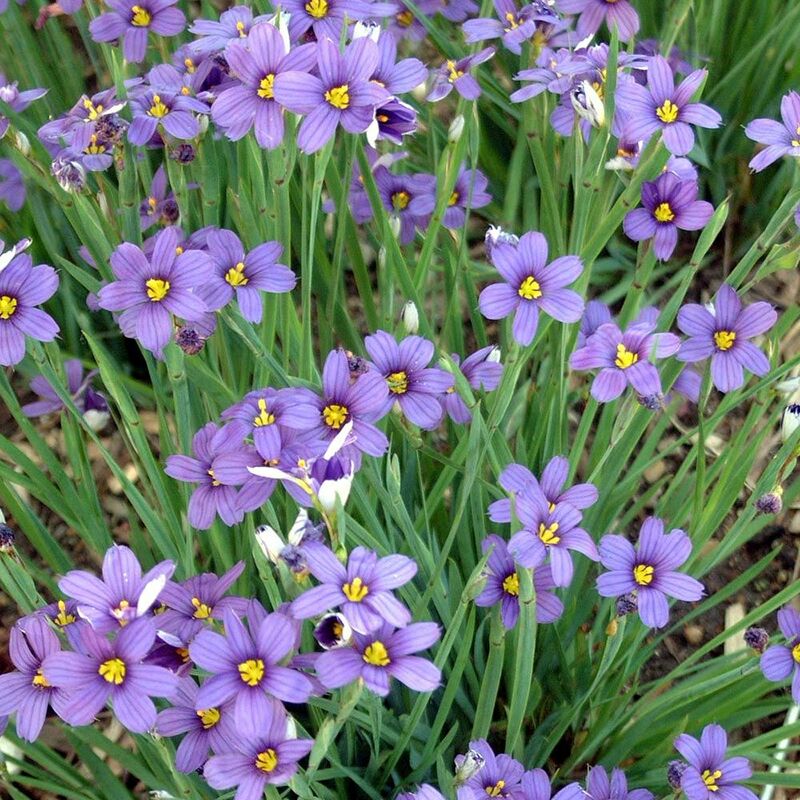 The Sisyrinchium Angustifolium Lucerne or Blue-eyed Grass thrives in a sunny or part shade garden. Producing lovely lavender blue flowers with yellow centers from May to July. The hardy Lucerne has blue-green leaves. Striking color combinations, the Lucerne is garden show stealer. At 12 inches tall, Lucerne is a deer resistant perennial. Grow in zones 3 to 8S/10W. 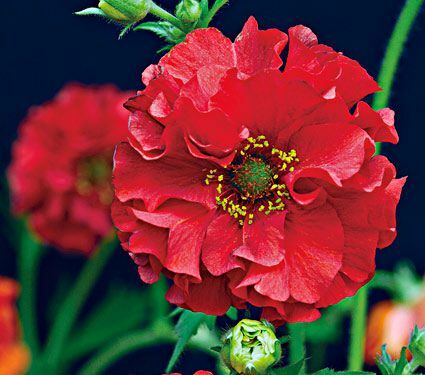 The Geum Chiloense ‘Red Dragon’ is a scarlet double bloom of red with gold centers. Blooms from June until August for a lovely scarlet garden. The Red Dragon reaches between 16 to 20 inches tall. Excellent choice for a sunny or part shade garden. Geum Chiloense grows in zones 5 to 7S/9W. 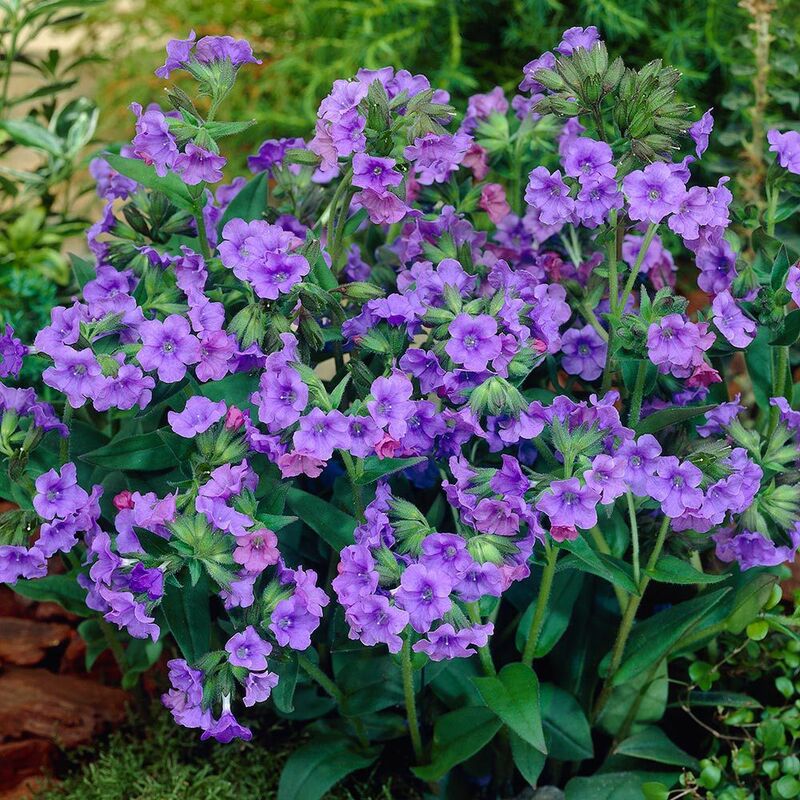 The Pulmonaria Blue Ensign, a Lungwort has solid dark green foliage with blue flowers. The gorgeous blue flowers appear from April through May. The Pulmonaria reaches 12 to 14 inches tall. A shade garden perennials favorite, it does well in a part shade to shade garden. The Blue Ensign is deer resistant. Grow in zones 5 to 8S/W. 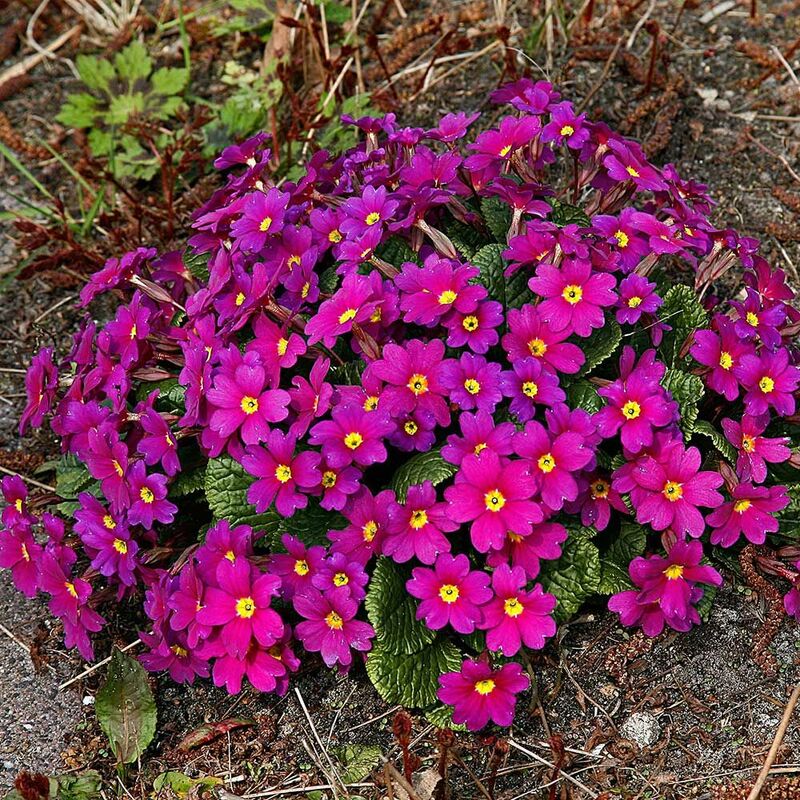 The Primula ‘Wanda Lilac Colors’ thrives in part shade. Wanda Lilac blooms from April until May. The hardy Primula or Primrose flowers appear in rosettes. A deer resistant perennial for shade prone areas. Thrives in zones 5 to 8 S/W. 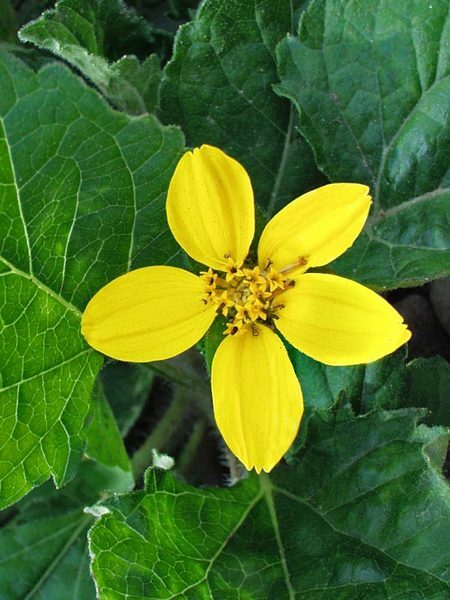 The Chrysogonum Pierre or Golden Star is a groundcover that has clump forming foliage. Long blooming, star shaped, golden yellow flowers appear from late Spring to early Fall. The evergreen 5 inch tall Golden Star grows in zones 5 to 9. Likes full Sun to mostly shady garden locations. The Chrysogonum Pierre can be used as an edger with blooms last for 4 weeks or more. Golden Star is shade tolerant, and dry shade tolerant. Thanks to Lynn from SE Michigan. Lynn caught our goof with the below Cosmic Orange. Cosmic Orange is actually an annual and NOT a perennial in most growing zones. We’ll leave it in the list since people are always looking for bright orange for their gardens. This is one of the few Cosmos that will tolerate shade. 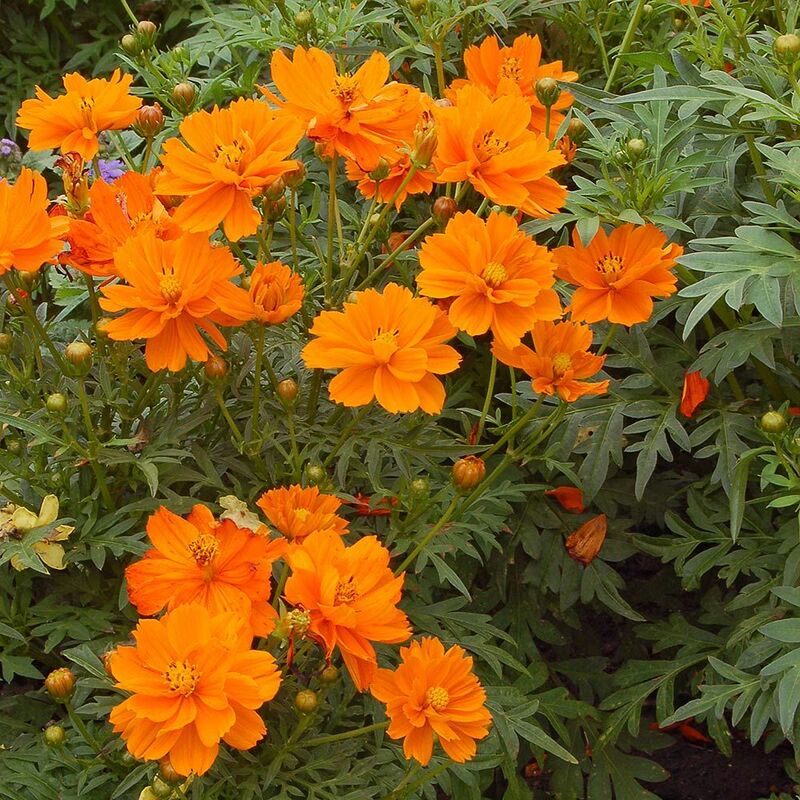 The Cosmos Sulphureus ‘Cosmic Orange’ is a Cosmos variety but please note it is an annual in most growing zones. 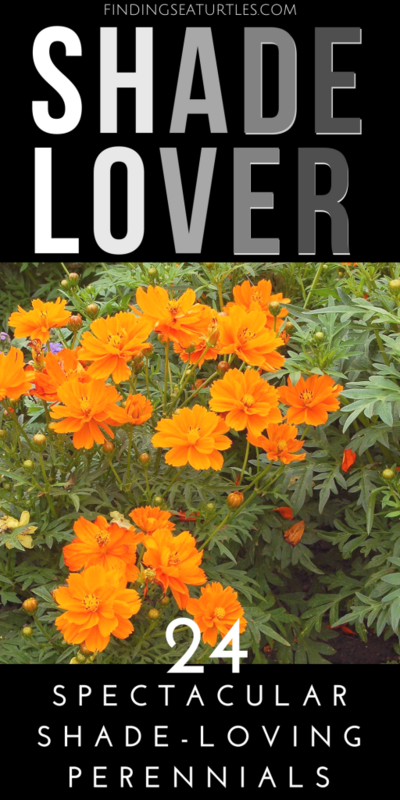 Cosmos produces 2 inch orange blossoms all summer long. The Cosmos grows up to 12 inches tall. Cosmic Orange loves a sunny or shady garden area. We love this new bright orange variety. Best of all, it will tolerate shade. 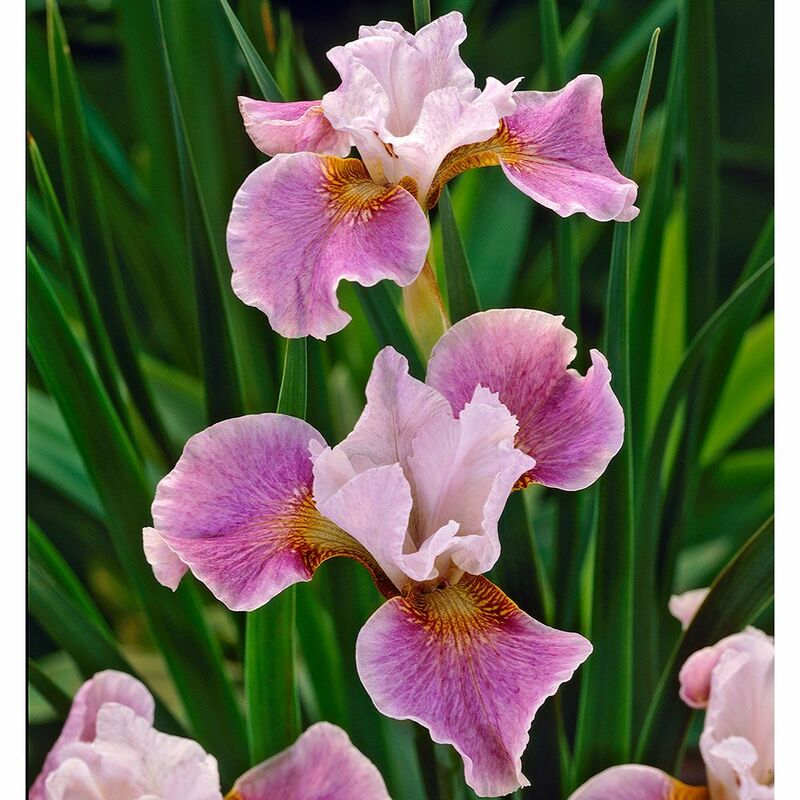 The Iris Sibirica ‘Dance Ballerina Dance’ is a Siberian Iris that thrives in a sunny or partial shade garden. A deer resistant perennial that blooms in June. The ‘Dance Ballerina Dance’ reaches a height of 20 to 30 inches tall. Grows well in zones 3 to 8S/9W. 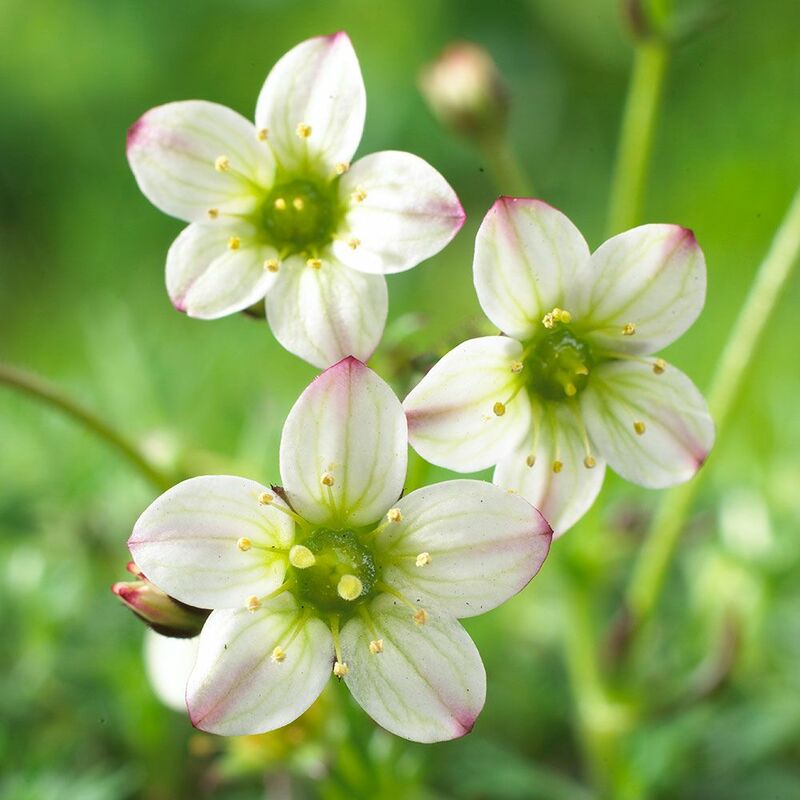 The Saxifraga x Arendsii Touran White blooms in March through April. Beautiful blooms of white flowers and pale green centers are stunning. The ground cover does well in sunny or part shade garden. Touran White does well in zones 3 to 7S/W. 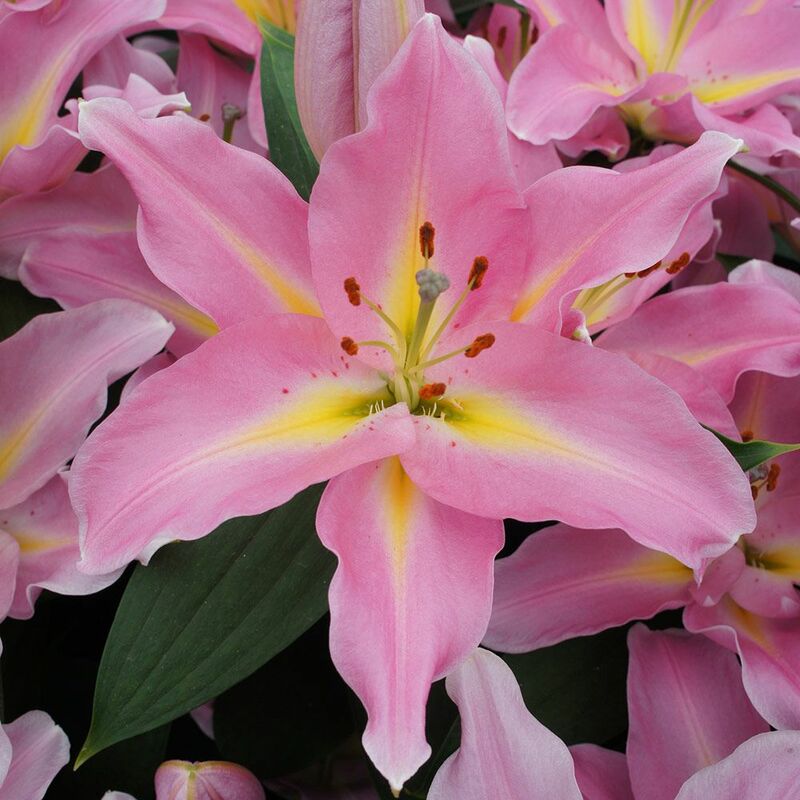 The Lilium Graceland is an Oriental Lily that has striking yellow stars with a rosy pink ruffled petals. The fragrant Graceland grows 3 to 4 feet tall, blooms in July and August. The Lilium Graceland can be planted in a sunny or part shade garden. Lillim Graceland can be grown in zones 5 to 8S/9W. The Athyrium Niponicum Pictum or Japanese Painted Fern have 12 to 18 inch gray green fronds. The fronds fade to silver at the edges. The Japanese Painted Fern thrives in a partial shade garden. A deer resistant perennial and favorite of shade garden perennials. Grows in garden areas with zones 5 to 8S/9W. 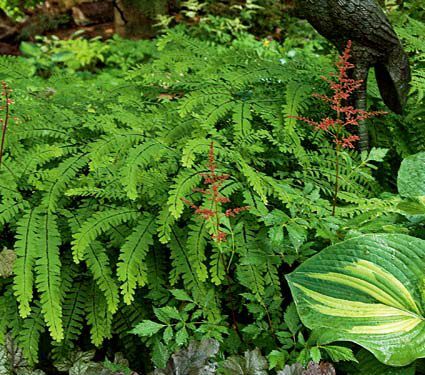 The Athyrium Filix-Femina Lady Fern grows between 30 to 36 inches tall. A deer resistant perennial. 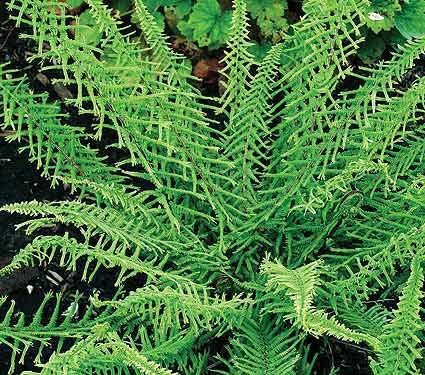 The Lady Fern thrives in a sunny or shady garden area. Lady Fern can be grown in zones 3 to 8S/9W. The Matteuccia Struthiopteris Ostrich Fern thrives in a part shady garden. The Ostrich Fern can reach between 4 to 6 feet tall! It is deer resistant and great for a woodland garden or damp areas surrounding a pond. The fronds are large, light green that resemble showy ostrich plumes. Grows well in zones 3 to 7S/9W. 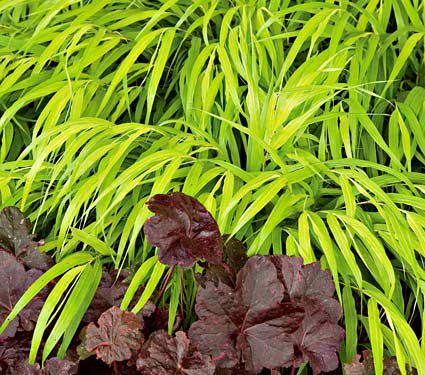 The Hakonechloa Macra ‘All Gold’ or Japanese Forest Grass thrives in a part shady garden. A deer resistant perennial that tops out between 1 to 2 feet tall. The Japanese Forest Grass has striking, bright golden foliage that cascades for a dramatic look. All Gold makes a great accent along a garden path or in a shaded garden perennials landscape. Grows well in zones 5 to 8S/10W. The Adiantum Pedatum Maidenhair Fern thrives in shade. Maidenhair Fern reaches 12 to 20 inches tall. A deer resistant perennial that grows in zones 3 to 7S/9W. 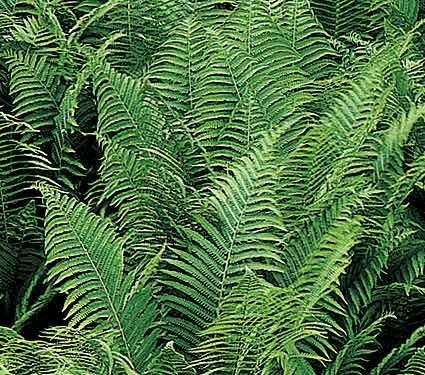 The elegant fronds are bright green on shiny, blue-black stems. 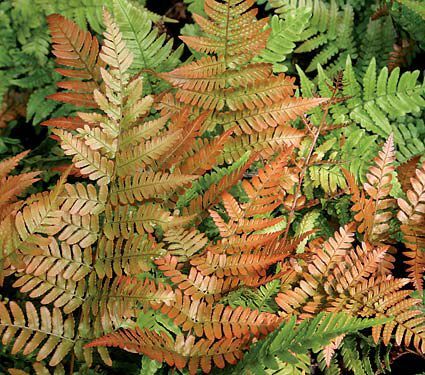 The Dryopteris Erythrosora Brilliance Autumn Fern, also called the Japanese Shield Fern thrives in a shady to part shady garden area. Reaching 24 inches tall, Autumn Fern grows in zones 5 to 9S/W. The Autumn Fern is deer resistant. Striking orange-red fronds with red spores on the undersides provide garden interest all Summer and Fall long. An easy to grow fern and drought tolerant once established in your garden. The Heuchera Shanghai or Coral Bells loves a part shade garden. The Shanghai Coral Bells blooms from June to July. 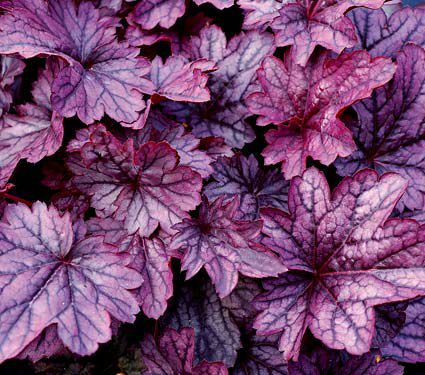 Reaches up to 10 inches in height and works well in zones 4 to 9S/.W The Heuchera has spectacular silvery, purple foliage and is deer resistant. 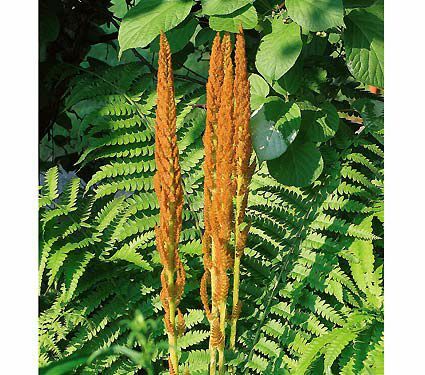 The Osmunda Cinnamomea Cinnamon Fern reaches between 3 to 5 feet tall. A deer resistant perennial that grows in zones 3 to 7S/9W. The Cinnamon Fern likes a sunny to part shady garden location. 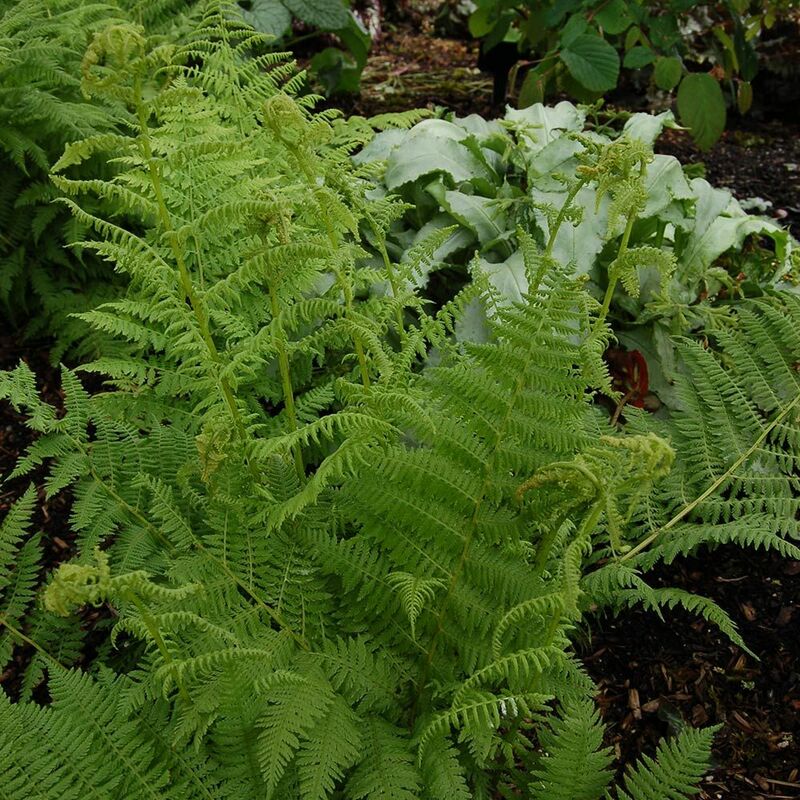 The fern has pale green foliage that darkens over Summer then turns a rich brown in the Fall. Provides Summer and Fall interest in your garden or landscape. 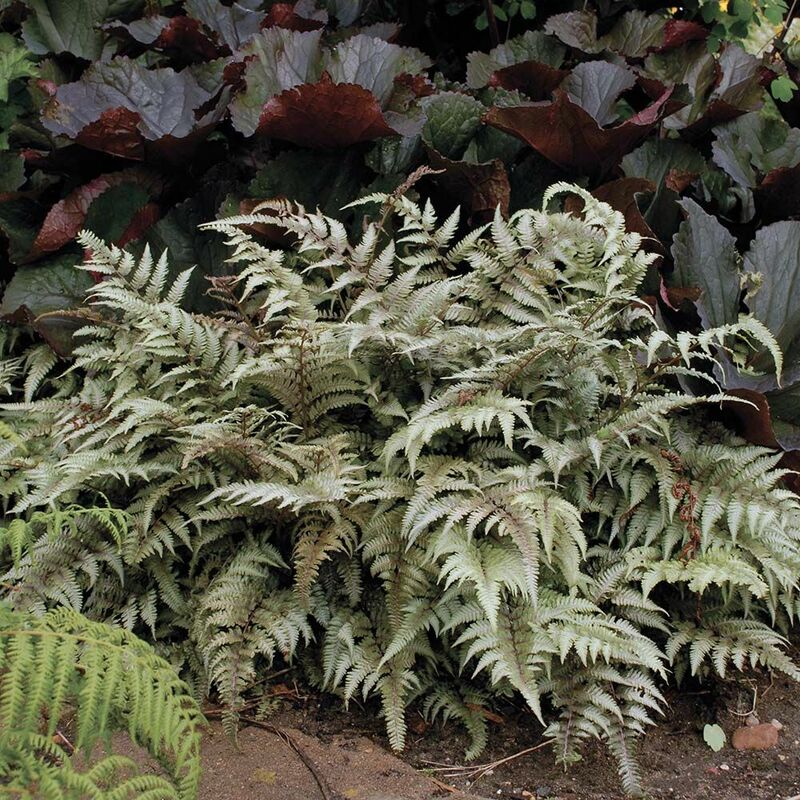 The Athyrium Filix-Femina ‘Dre’s Dagger’ or Crested Lady Fern loves a part shade to shade garden area. The Crested Lady will reach up to 18 inches tall. A deer resistant perennial that thrives in zones 4 to 8S/9W. The Crested Lady Fern is a dwarf form of the Lady Fern. The deep-green fronds with an intricate leaf structure delivers diverse foliage textures in the garden. 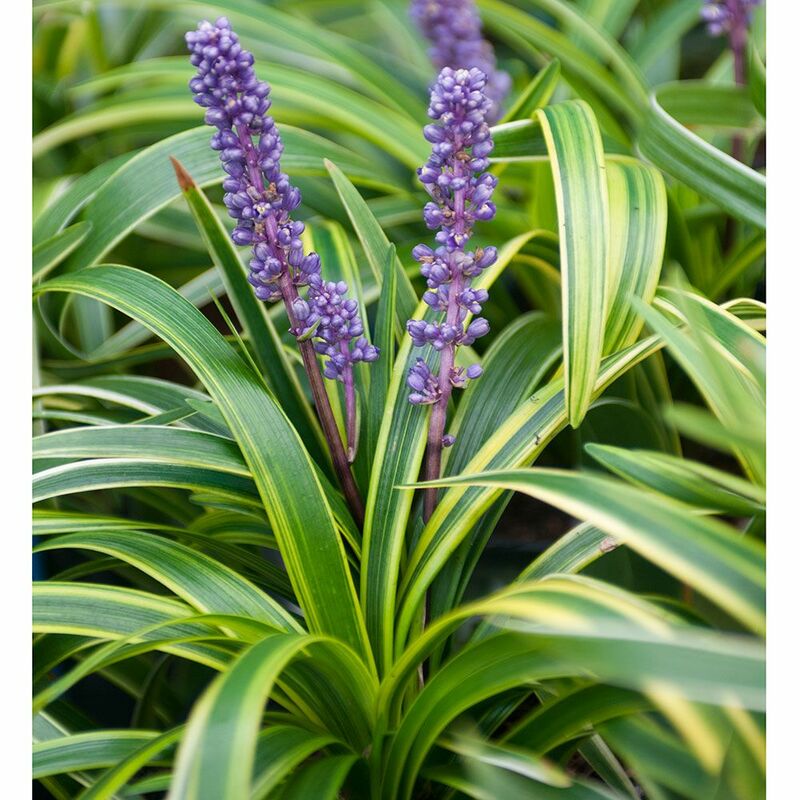 The Liriope Muscari ‘Variegata’ is a Lilyturf that does well in either a sun or shade garden. The deer resistant Variegata blooms in August and September. Topping out at 20 inches tall, Liriope is ideal for zones 5 to 10S/W. The Liriope is an evergreen perennial that forms deep carpets of grass-like leaves. Tough and gorgeous color! These 24 Spectacular Shade Garden Perennials can make your yard look fabulous. Many of these perennials are deer resistant and shade loving. Create a spectacular garden style with these plants. 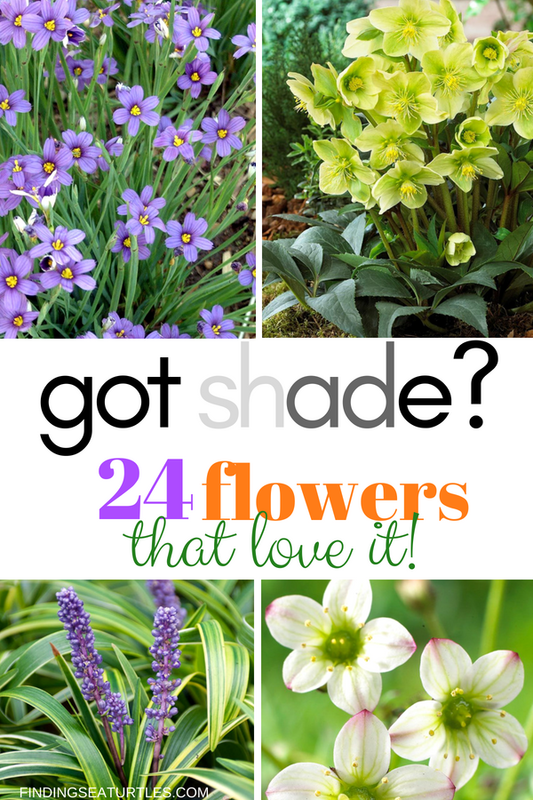 If you try any of these 24 Spectacular Shade Garden Perennials let us know how you make out. For additional gardening information on fragrant perennials read our post 32 Most Fragrant Perennials. For some money saving ideas on growing perennials from seeds, read our post 21 Gorgeous Garden Plants to Grow from Seeds. If you have any questions, feel free to reach out to us in the comments below. We always are ready to help you out. My first question when I read an interesting article like this is what hardy zone will these plants survive in? Can you provide that information as well? Hi Judy! Thank you for your message. Hardy zones in the US are difficult to determine, however if you click the link for the particular perennial you are interested in, White Flower Farms provides you with their best recommendation. Southport NC reaches winter temps of below 30, and our ground is all sand. Please recommend perennials. Thank you. Hi Lynn! Wow, thanks for your sharp eye, we’ve been focusing on perennials and you are absolutely correct, Cosmos are annuals in most zones and should not have made the list. We agree though, this orange variety is gorgeous (and one of the few varieties that endures shade). Cosmos actually reseed quite often for us year after year despite north east winters. We updated the article with an interesting evergreen ground cover (Chrysogonum Pierre) with cute little yellow star flowers that will tolerate shade. We just published the ‘Sun’ list for sandy soil perennials, so hopefully you’ll find some interesting options that’ll work up in SE Michigan. Thanks again, happy gardening and apologies for the goof! Great article. Can you suggest perrennials for shade that also must be tolerant of walnut trees? Thank you!! hunt ffor something relating to this. Thanks you for sharing your knowledge ! Well written ,most informative,beautiful pictures. Recommendations for seeds & bulbs,etc ? Hi Deborah, Thank you for your kind words about our post! Recommendations for Spring blooming bulbs (includes Sun to part shade) are included in these posts: for daffodils see – https://findingseaturtles.com/spring-blooming-daffodils/ for tulips see — https://findingseaturtles.com/spring-blooming-tulips/ for other Spring blooming bulbs see – https://findingseaturtles.com/spring-blooming-bulb/. This time of year, I can’t seem to find many seed companies that have seeds available for purchase. Early next year there should be more seeds available for you to select from. I’ll be posting a follow up post early next year with information on seeds. Many of these plants are quite unique do you have, order or are you a nursery that sells these specific varieties? Once I dig in and do my research I would like to be able to get some of these specific varieties. I live in zone 7B – 8A in Georgia. I have recently (this Fall) put in a dry creek bed due to drainage problems in my backyard also added a very nice shaded area that I want to create a nice garden and sitting area. I do have a pretty good nursery nearby but know I can’t get some of these. Hi Floren, Glad that you enjoyed the post. I am not a nursery. I’m a gardener and love gardening. Hi Floren, The Chrysogonum virginianum Pierre or Golden Star can be ordered from Bluestone Perennials in Madison, Ohio. It is also available for pre-order with a Spring 2019 delivery based on your hardiness zone. The other plants can be found at White Flower Farm, Litchfield, CT. Good luck with your landscaping projects, sounds exciting! Mary at FindingSeaTurtles.com. Hi Floren, Merry Christmas to you! Do you have any suggestions as to where I might be able to get these specific varieties? I recently put in a dry creek bed and added a nice shaded area to my property. I would like to grow a really nice shade garden and plants along the creek bed. Guess I couldn’t get lucky enough that you are a nursery could i? 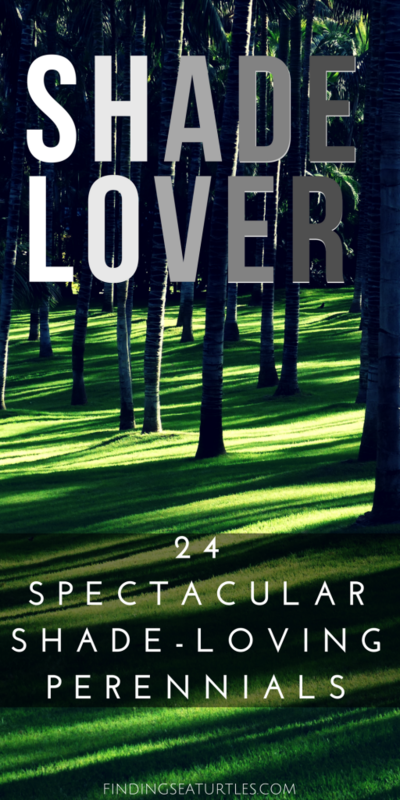 I just found your site through Pinterest and enjoyed your piece on shade tolerant perennials. I live in Wisconsin in zone 5B. I’m very interested in native plants, particularly woodland varieties. What are the chances you have knowledge of these choices? Do you already have an article on native perennials?